On 13 August, the Union Home Minister Rajnath Singh launched a slew of "smart city" projects, which included some areas of the national capital Delhi getting free Wi-Fi and high-speed broadband. To invite customers to join a daily lucky draw and entitles winners to one year of free broadband service, the internet service provider (ISP) Connect Broadband,on 10 August, launched its brand campaign ‘Dil da Connection’. 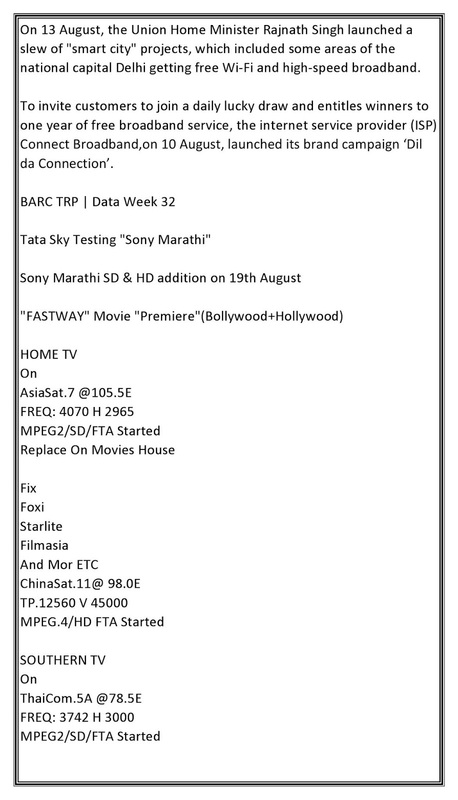 Tata Sky Testing "Sony Marathi"